Hey all, just want to post a quick update on progress with the new release and also to drop some screenshots of the political system ui. I am closing in on the end of this release, as only a few bugs remain to be squashed (mainly dealing with the new faction system). Hopefully I'll have these buttoned up in the next couple of evenings and the release will likely drop early next week. Thanks so much for holding out so patiently for this one. 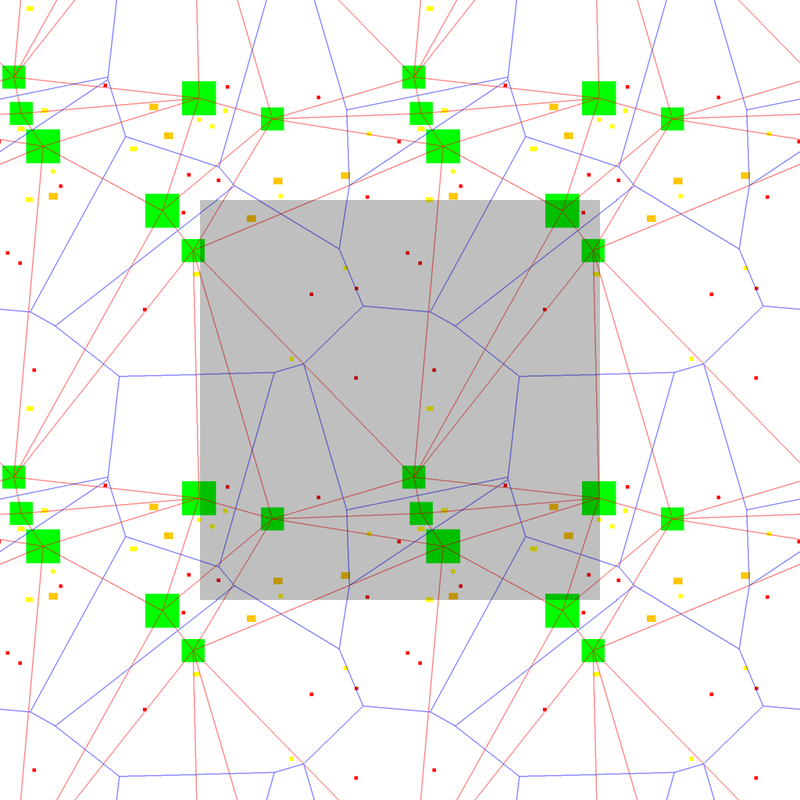 It turned in to a gargantuan update, and I think it breathes a lot of life into the procedurally generated maps. I hope you like it! 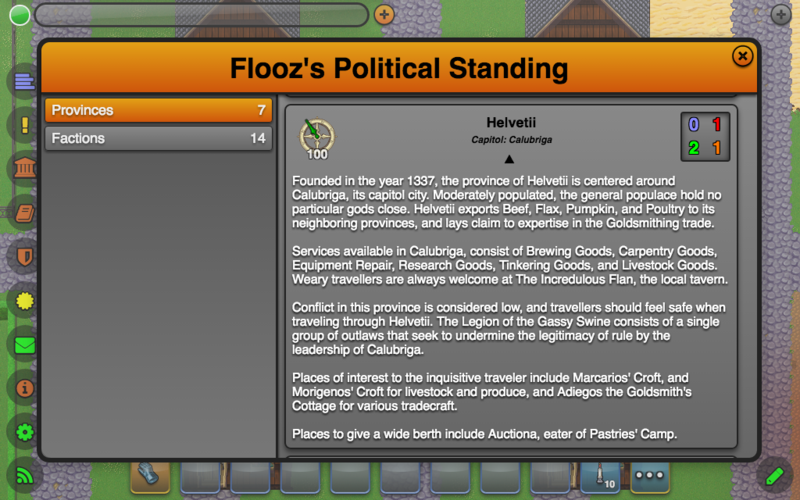 Here is the provinces section of the new politics ui. You'll be able to glean a good bit of information here regarding the various communities in game, such as distance and heading to the capitol, the number of lyceum, farms, tradesmen cottages, and bandit camps, and many other things. Also, GMs will be able to quick travel to a province's capitol by clicking on the compass in the top left of a province's panel. 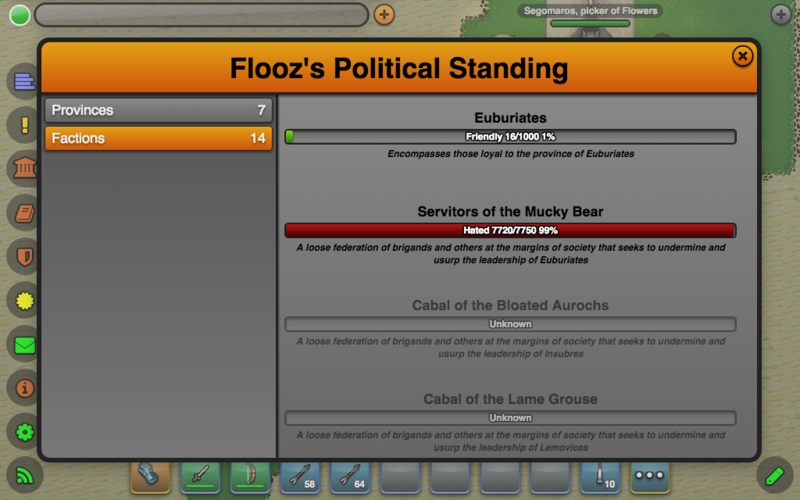 This screenshot shows the factions portion of the new politics ui. You'll be able to see your current standing with various factions here. This is a simple rendering of what the provinces look like in game. The blue lines denote the provincial boundaries, the red lines denote the connections between province capitols, green is for the capitol, orange for lyceum, big yellow for farms and little yellow for tradesmen cottages, and red for bandit camps. When do you release it ? I was just getting ready to post an update. I am in the process of committing all the changes to version control and getting the release notes together. Should drop the first batch of notes this evening. It'll be out soon, thanks again for your patience! And now are you ready to maybe post on Greenlight too ? Running a little behind on the notes. Will have some up tonight, I promise. The rest will go up over the weekend.